There was a little coffee shop in the neighbourhood where I grew up, squeezed into an alley-wide space between a bank and a pharmacy, called “The Seven Wonders”. It may have been here, eating french fries and sipping cherry coke, that the seeds of my wanderlust first took root as I imagined myself traveling to each of the exotic and magical places depicted on the colourful murals that embellished the walls. I remember them to this day – the great pyramids of Giza, Victoria Falls, the Colosseum, the Great Wall of China, Stonehenge, the Grand Canyon and the Taj Mahal. “Wonders of the World” lists are confined to a meagre seven ‘wonders’ as the number, in ancient Greece, represented perfection and plenty but the concept of “wonders” has evolved to include subsets like ancient wonders, oceanic wonders and natural wonders. Even those lists are limited to seven but the list is periodically revised, giving rise to much excitement and a flurry of email and Facebook campaigns by promoters of the Bay of Fundy as a candidate for inclusion into the exclusive “Seven Natural Wonders” club. Just such a campaign in 2011 was not successful but nonetheless did wonders (shameful pun) in promoting the Bay of Fundy as a tourist destination and it peaked my curiosity to see what all the fuss is about. 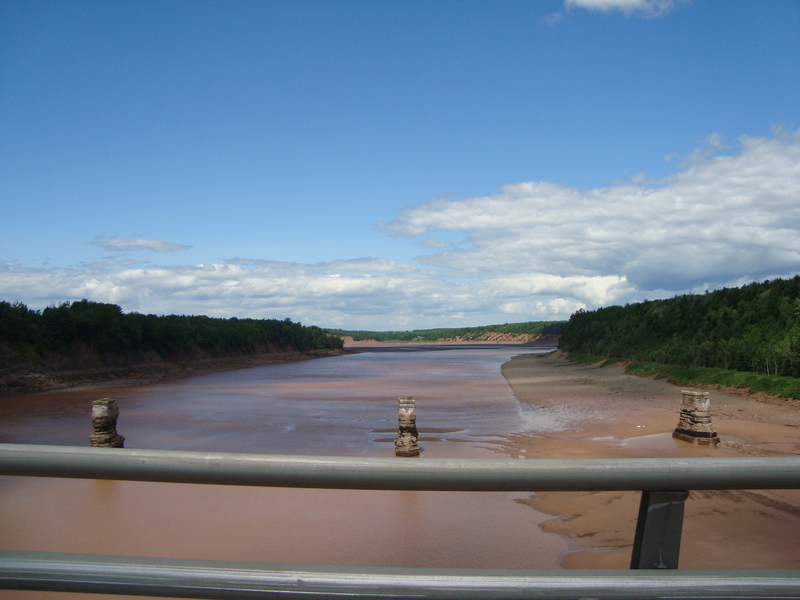 Crossing the Shubenacadie River en route through the Annapolis Valley to Digby – first indication of the unique tidal activity here. Low tide reveals the remnants of old railway pilings that act as a yardstick for the extremes of tidal movement for which the area is famous. A vistors centre at the south end of the bridge across the Shubencadie River includes a short stroll to a lookout with great views in all directions. 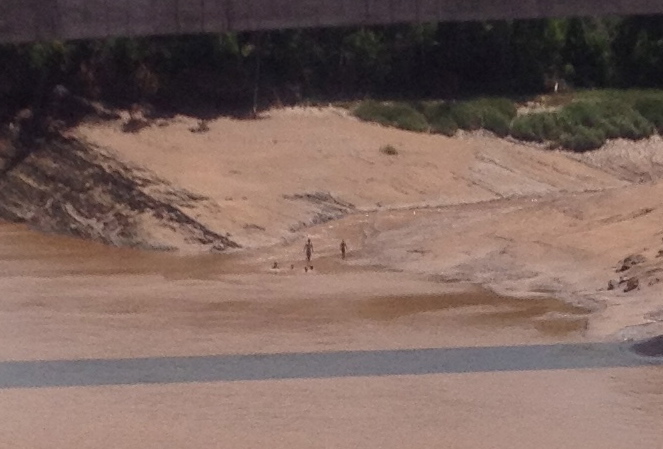 I loved watching these kids splash and wade in the thick red ooze as the Shubenacadie drained out to low tide. I wonder if this might be just as effective and a lot more fun than those expensive spa mud packs? 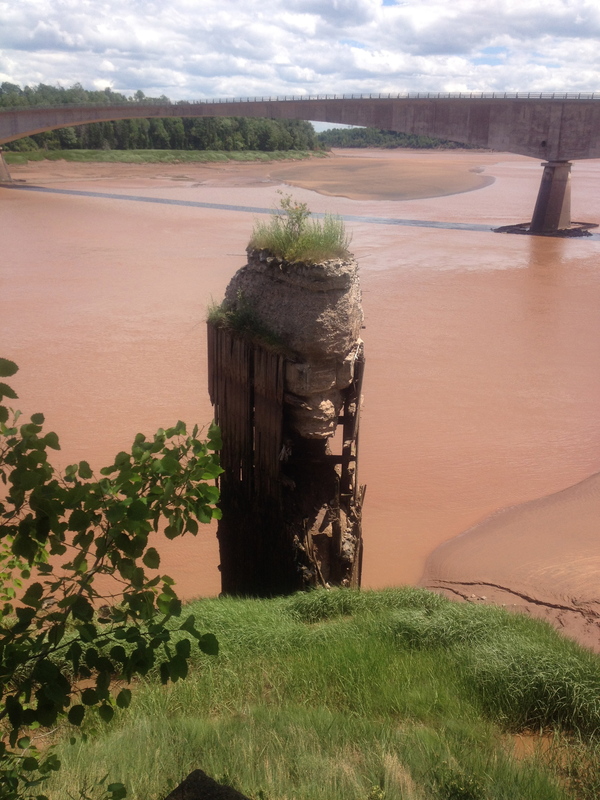 Surfing expeditions take advantage of the tidal bores created as the incoming tide in Minas Basin, near Canning meets the outflow of the Shubenacadie River. 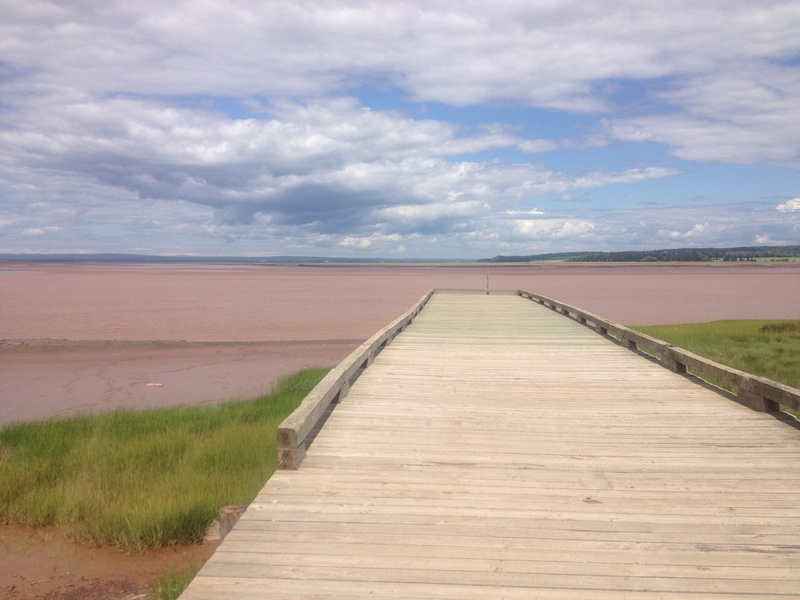 Minas Basin at the northern extreme of the Bay of Fundy. I’ve paid significant bucks for those jars of “Dead Sea Mud” sold in kiosks in shopping malls that guarantee to reduce signs of aging. 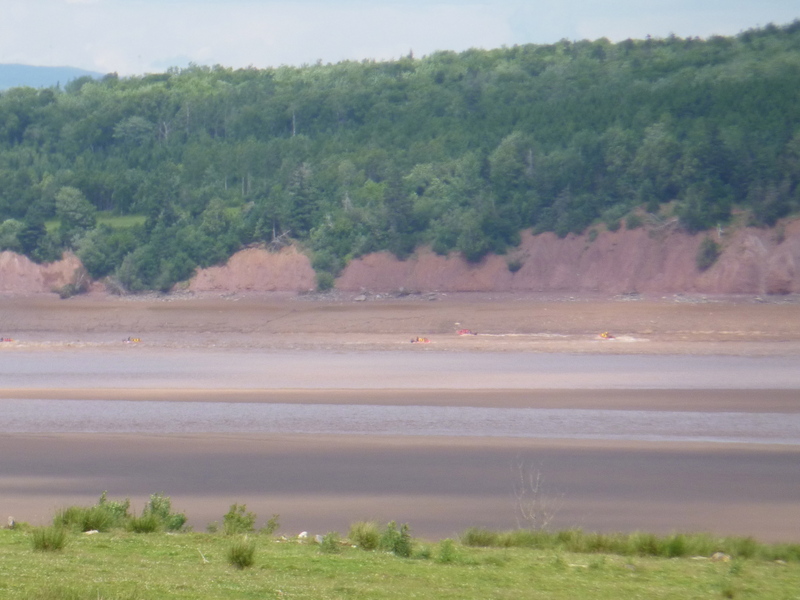 This “Bay of Fundy Mud” ought to be just as effective and seems to be in plentiful supply. It would also support my ‘buy local’ initiative. My preference on any journey is to migrate to water, meandering along the shoreline to my destination. This proved challenging as the route along the Bay is considered by locals to be anywhere from ‘rough’ to ‘impassable’. So beating a direct path to Digby along the inland highway seemed the best option. When I come here again I will make time for side trips off the highway to wander tree-lined streets and learn more of the history of some of the oldest settlements in Canada, many originally surveyed by Samuel de Champlain. Wolfville, the quintessential college town, is home to Acadia University. Grand Pre, a UNESCO World Heritage site is steeped in history having periodically been the site of epic battles between the British and the French. This area is the ancient home of the Mi’kmaq and was made famous by Wadsworth’s poem Evangeline. 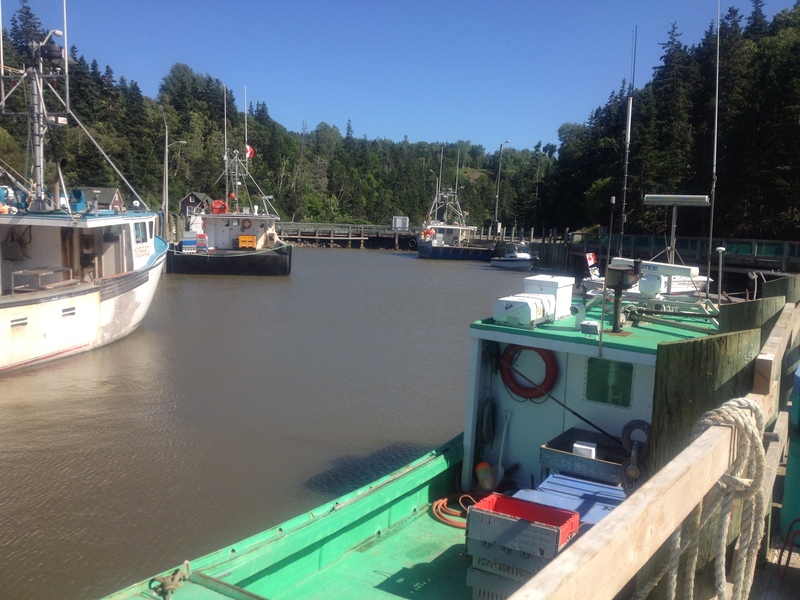 Digby – “The Scallop Capital of the World” – looks and feels like a working town, dominated and supported by Canada’s largest scallop fishing fleet. 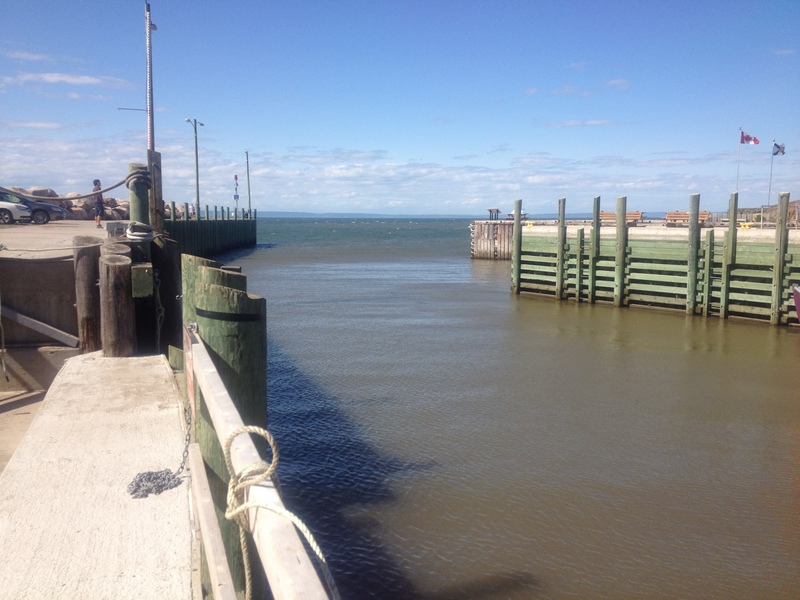 The broad wooden docks are the most prominent feature of the town and also serve to mark the extreme tides. 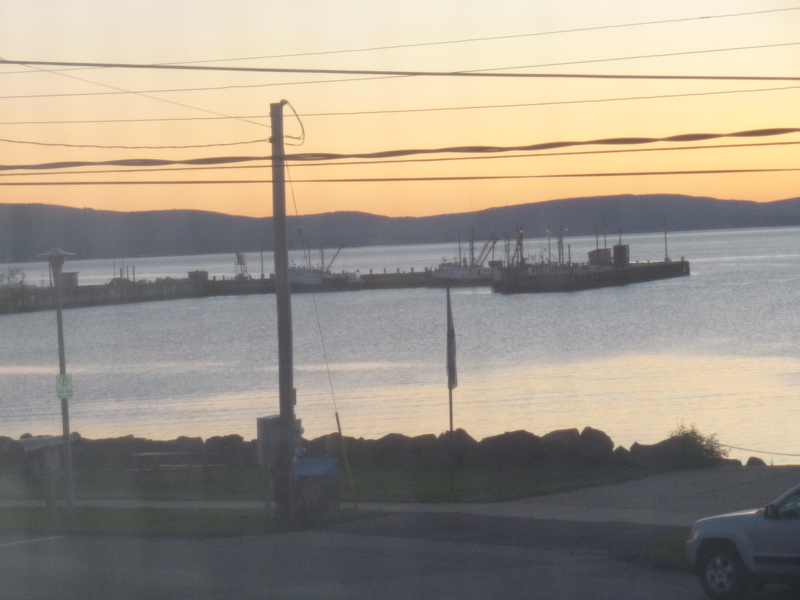 View of the same government dock at high tide in the wee hours of the morning from the window of the Bayside Inn in Digby. 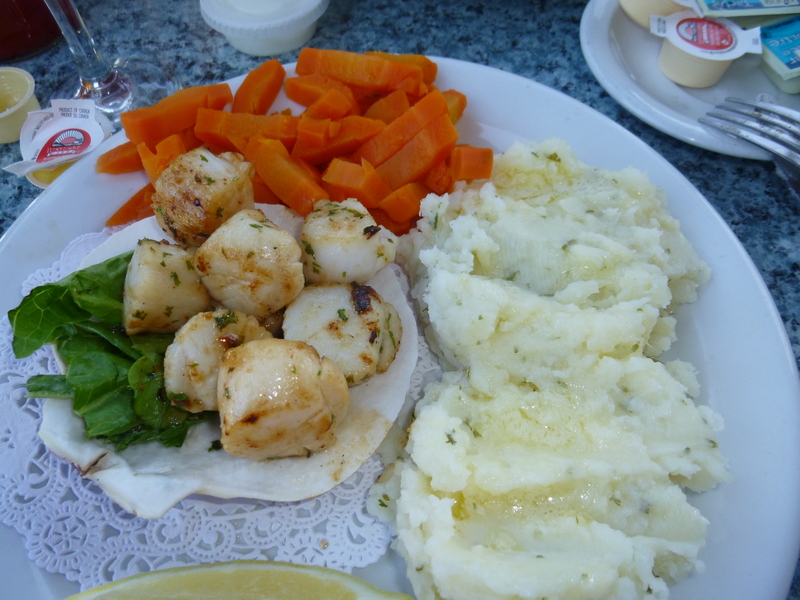 It would have been disrespectful to order anything but scallops here and man, oh man were they ever good! The dearth of tourists was notable everywhere on this trip. I had expected to be elbowing fellow sightseers on the sidewalks but it felt like tourist season, which is short enough already in this part of the world, had by mid-July not yet begun. Although it made for very pleasant travel conditions, it was easy to see the nervousness of innkeepers and shop owners when I asked “Where is everyone?” The talk in coffee shops and over an evening pint invariably turned to the impact of the rising Canadian dollar, and the recent requirement for Americans to have a passport to travel outside the U.S. So the real questions was “Where are the American tourists?” It was sadly apparent that many are just not coming. Our inn, as well as a number of other places and attractions along the route, was for sale. I wonder what this area might feel like in a few years if tourism doesn’t pick up and if the places and attractions that depend on it cannot be sold or maintained. 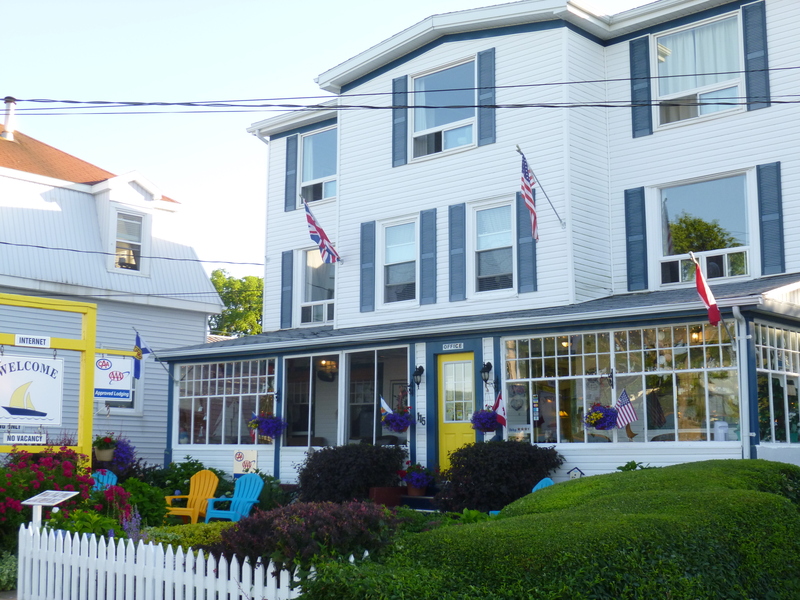 The vintage and very well-situated Bayside B + B is ‘For Sale’. The delightful and attentive owners would like to retire. This cozy spot on the hill just outside of Digby – with a spectacular view up the Annapolis Basin – is also ‘For Sale’. 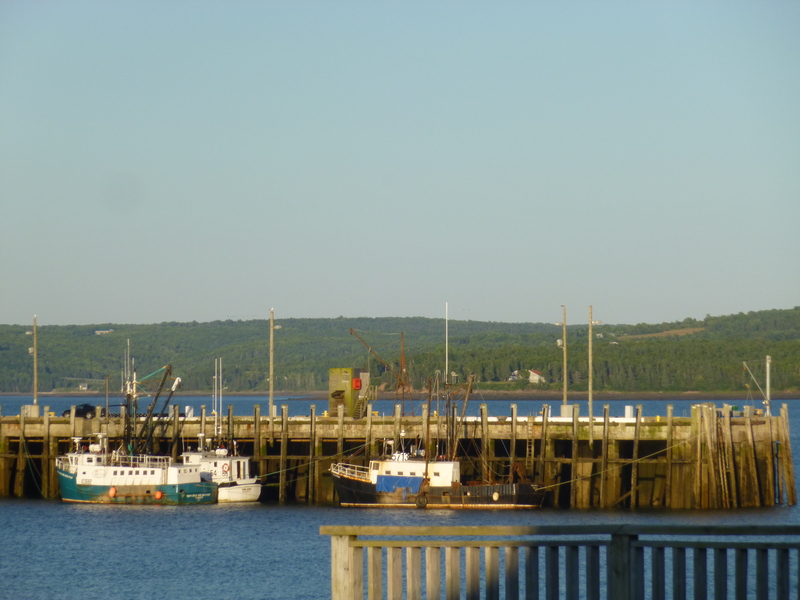 The cozy town of Digby – pop. 2029 – as seen from the pier. With the extremes of tidal activity in the Annapolis Basin and the Bay of Fundy it seems like a no-brainer to try to harness all that water power. 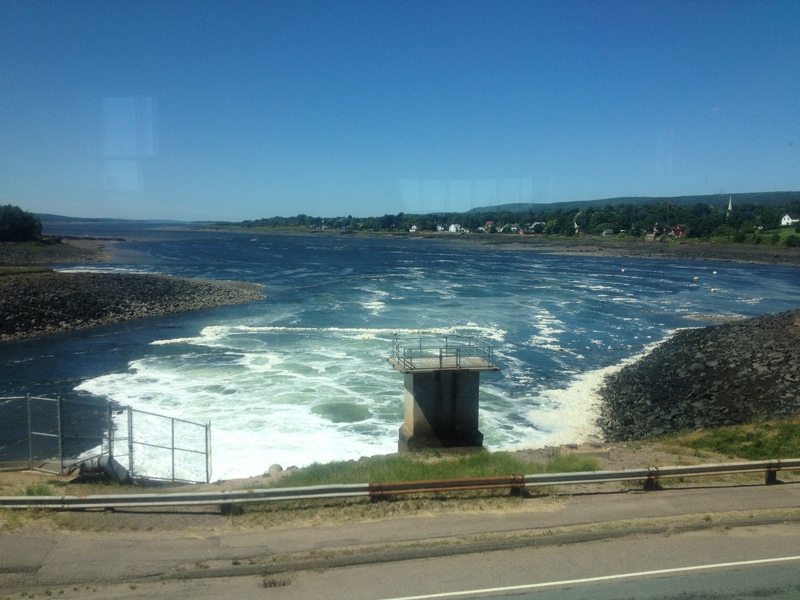 The Annapolis Tidal Station at Annapolis Royal northeast of Digby generates, without dams or head ponds some 80-100 megawatt hours of power and the Interpretive Centre there is well worth a stop. This is the only tidal bore energy plant in North America and one of few in the world. Annapolis Tidal Generating Station – the guide here had all kinds of stories about small boats that, over the years have come too close to the current and had to be rescued before being sucked into the turbines! 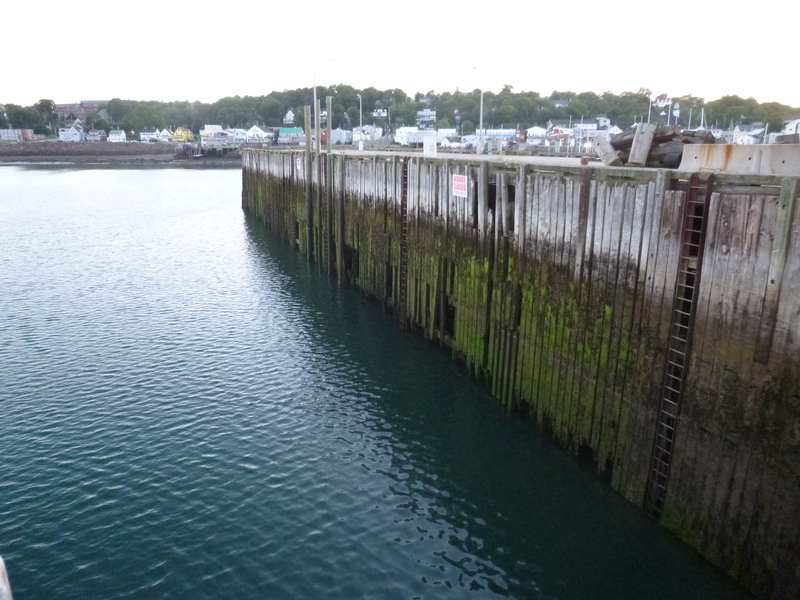 Hall’s Harbour emerged as a must-see after leafing through an album of photographs at the Bayside B & B in Digby. Not only does it sit right on the shoreline of the Bay of Fundy but the route to Hall’s Harbour looked, at least on the map, circuitous and somewhat unpredictable which always appeals to me. 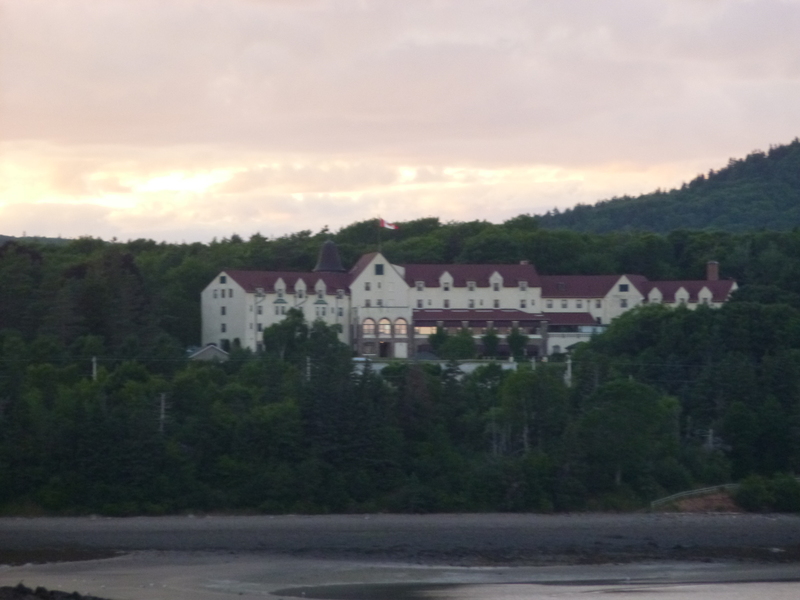 It’s also another great place to get a sense of the Fundy tides. Hall’s Harbour is believed to have been named after an American privateer who used the secluded cove to mount attacks against the British. The drive was certainly circuitous but gorgeous and was soundly rewarded at the end with a delicious fish and chip lunch at the edge of the tiny but exquisite harbour very much off the beaten path. Sitting at the Lobster Pound on the edge of the harbour you can see the incoming tide flow in great waves through the narrow entrance. At low tide all of these boats are sitting on rocks and mud and the harbour entrance is almost impassable. In the forty minutes that it took to have lunch the tide came up five feet. This is almost all there is in Hall’s Harbour – a tiny, narrow cove at the sharp bend at the foot of a winding road down the hill to the seaside. Narrow and perilous entrance to Hall’s Harbour. Forty minutes earlier the left half of this waterway was exposed rock and mud. 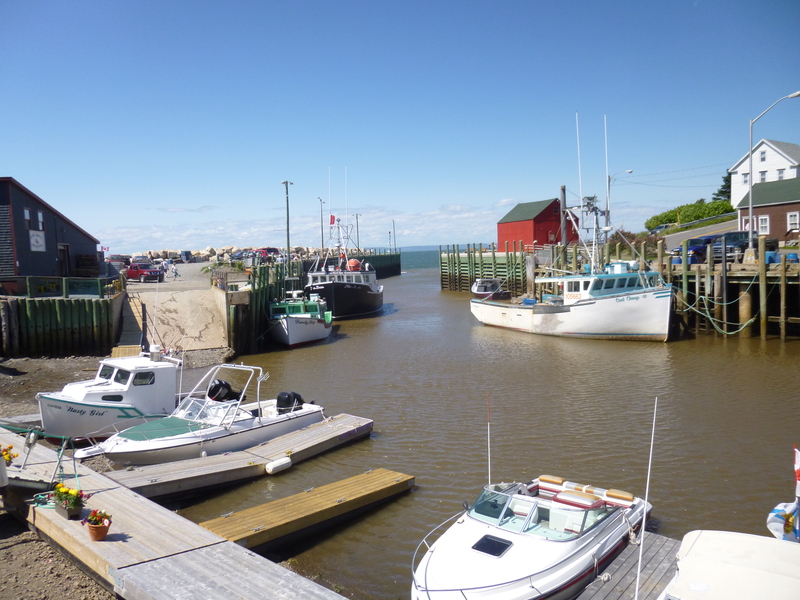 Beautiful Hall’s Harbour from the dockside restaurant. What a welcome sight this protected place would have been for fishermen returning from a turbulent sea. 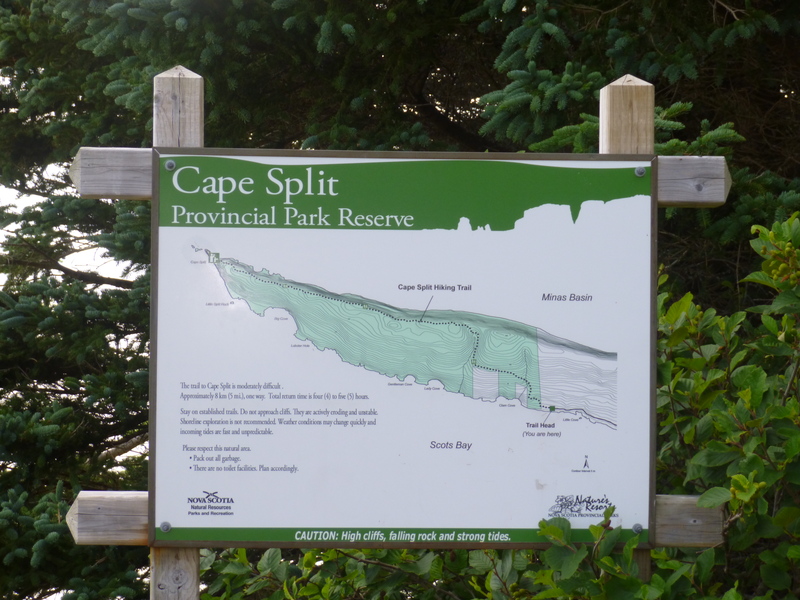 Cape Split Trail map. Time did not allow for this two mile hike (each way) out to a spectacular promontory on The Bay of Fundy. The “CAUTION” at the bottom of this trail map sounds so inviting that I know I will make time for it when I come back. If you saw the movie “Thelma and Louise” you might think of this as a plausible location for ‘that scene’. 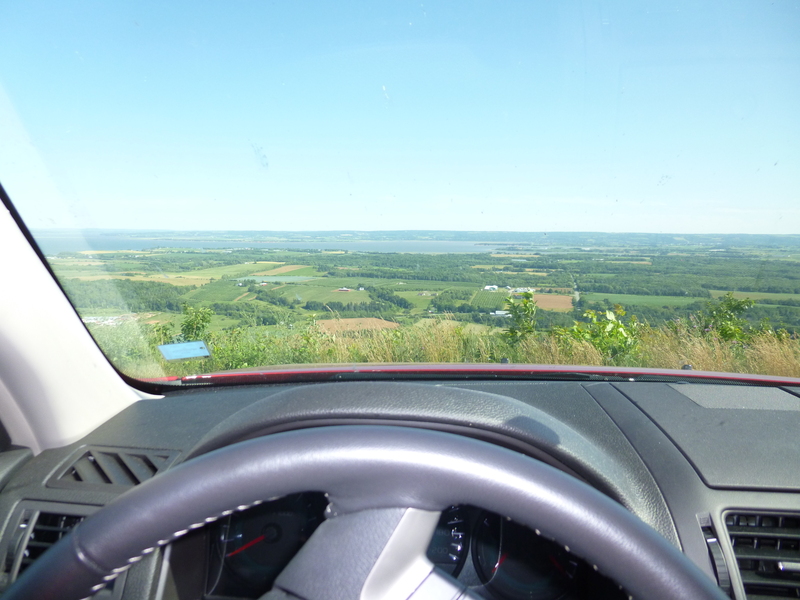 It’s a place called “The Lookoff” with a panoramic view of the Annapolis Valley. I think I could see my house in Vancouver from here. WOW – my vocabulary isn’t as wonderful as yours, but WOW! awesome pictures, and great commentary!